The electrical is done. Ryan came on Saturday and installed the new kitchen switch. Everything now comes on with the exception of the light over the sink. He believes that's a problem with the fixture. 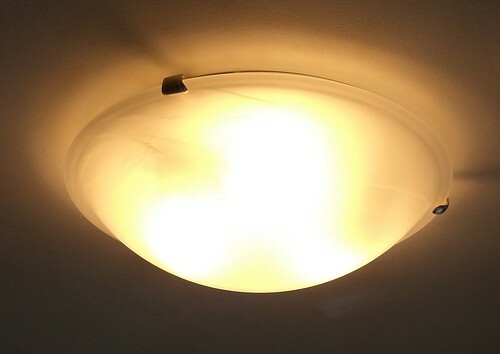 I will have to do some research into finding the appropriate fixture for that light, assuming I want to replace it. I'm not sure I do. I used to keep it on when I had to go somewhere at night because the back light didn't work. But, with the new switch installed, which is, incidentally, the quietest light switch I've ever seen, I have a back light now which removes the need to have the over the sink light on to see. The other reason I'm not overly worried about not having the light over the sink is because of the brilliance of the new kitchen light. This is the old light. It was two bulbs opposite each other. At one point, it had a cover. Carole remembers the cover being a white frosted glass with flowers on it. I don't remember it. She also said we were cleaning in the kitchen and the cover was bumped and cracked. This was a long time ago. I don't remember that incident at all. I just remember this. Well, that's gone and has been replaced with this. That's 3 bulbs instead of two in about a 1.5 times bigger light. The amount of light in my kitchen is amazing now. 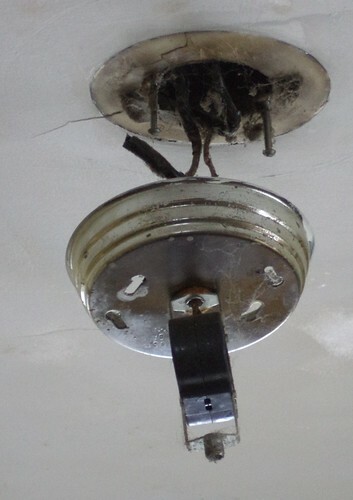 So, the next step is to remove the broken floor lamp I was using. I'm so happy with this. Now we move to the back bedroom. 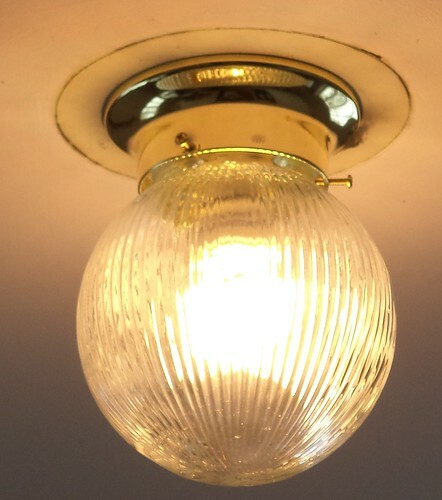 This fixture was a single bulb. 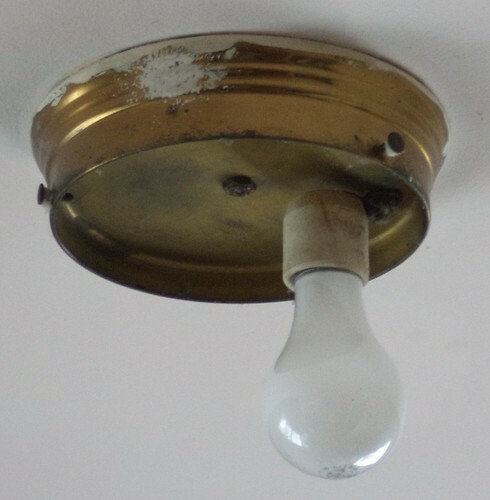 There was a globe over this but, in changing a bulb, it was dropped and broke. That was replaced with this. It's so lovely in that room now. I really need to work on it, to make it the room I want it to be, even with the litter boxes there. There are things that I can do, decorative things, to screen the boxes. The girls would not like to go into the basement now that they have been upstairs for so long. This could become my reading room and a daybed would fit in it very nicely. That means I have to move a lot of the stuff that's stored in there, but such is life when you're changing how a room looks. First thing, though, it has to quit snowing. I refuse to do any painting or other stuff when I can't open the windows. Lastly, my home office. I neglected to take a photo of that light but it was exactly like the one in the bedroom excepting the fixture was darker. I replaced it with this. I love the art deco-ish look to this. 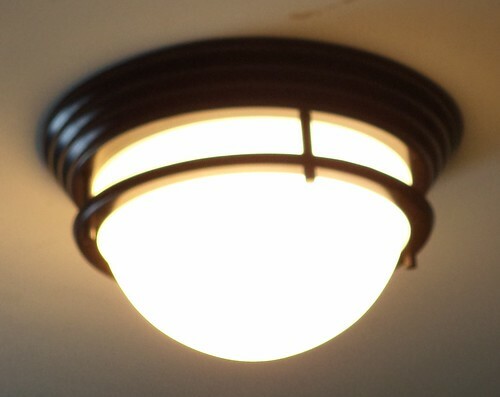 I didn't realize it but this is a 2 bulb fixture. Right now, there are 2 incandescent bulbs in it. The kitchen and back bedroom are compact fluorescents. As every other overhead light is CFL, I won't have to replace those for a very long time. This will be the only light that needs replacing and then, when I do, it will be with CFLs. The last thing he did was to tighten up the outlet in the office where I plug in the computer. I need a faceplate for that but I'm really picky about my faceplates so that's a work in progress. I have to admit to walking through the house on Saturday turning off and turning on all the lights that work again. Simple things make me happy and this has been a wonderful pleasure.